Please note This Product does not contain any alcohol or Liquor based product. 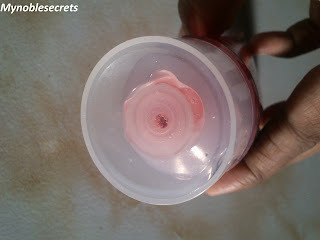 The Face wash tube itself wine colour one :) and it has scroll type lid. The Face wash has mild smell of Grapes (This smell remembers me Saslic face wash) . The face wash looks like a semi liquid gel. I will always think about wine for anti ageing. But, I didn't get a chance to use. 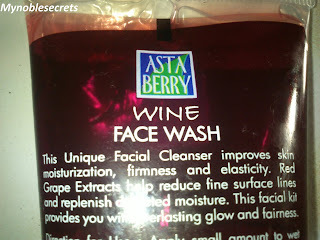 I have heard about wine facial for matured skin and it will keep our skin younger. 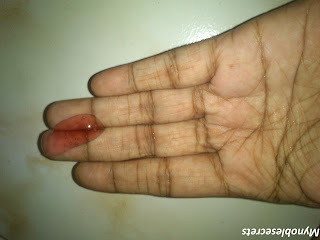 This is my first try of wine related skin care product :) . 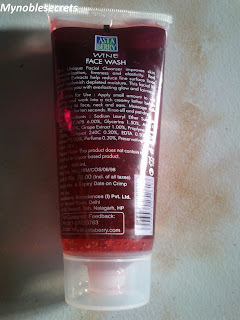 For me it is easy to take the face wash and it smells very mild won't annoy our nose. It is not all lathering, not a problem for me. because I believe strongly that the products which is not lathering much does not contain harsh chemicals. It removes dirt and make up very well from my face. This cleanse very well and leaves my skin so soft and refreshed. It calm downs irritated skin. From my experience this face wash doing great job very mild one. Suits a lot for my Sensitive skin. This neither leaves skin dry nor oily. I can feel the soft by touching my face all the time. It helps a lot in firming up the matured skin and tone up very well by regular use. But I need little extra amount of face wash for wash. I didn't see any changes regarding pimples cure. of course this face wash is not for pimples. I am seeing that my face complexion improving.The results are slow and steady. I love it a lot :) . It is not irritate my eyes while washing also a proof that it is not contains harsh chemicals. This is affordable face wash. This face wash makes skin soft and clean. 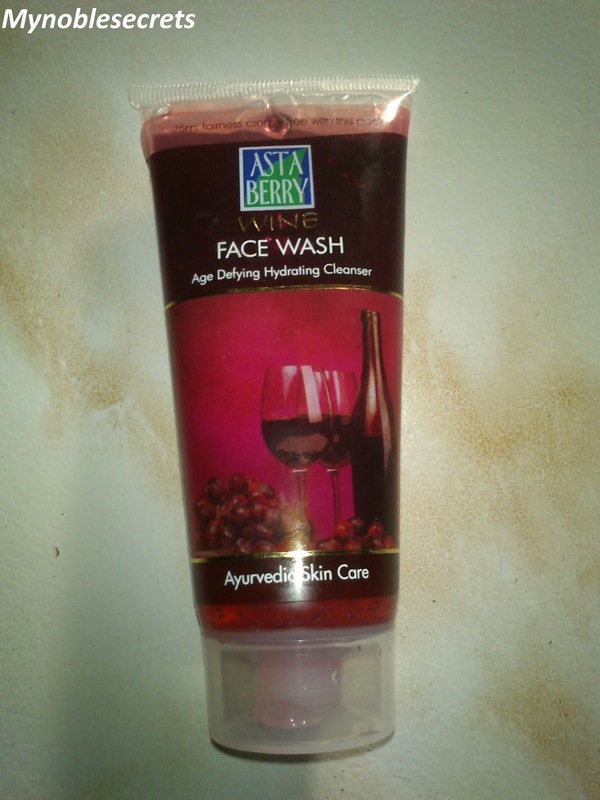 This face wash firm and tone up the matured skin. It improves face complexion and give glow. It is an ayurvedic product which has no harsh chemicals. Those who wants to try wine for their face can give a try in a affordable price. It won't dry up your skin. It is best for Dry skin beauties. Can get only through Online shops. Needs extra amount to wash face. Share your Thoughts and Stay Beauty. lovely review rads...seems to be nice product..send me link of ur latest posts will see when reach in punjab..
have u tried asta berry's skin lightening cream? m using it right now..n dnt find much diff in my skin its rather looking patchy..
i have dry skin type , i m 22 yrs old ,my skin is getting dull ( with no glow , no shine ) should i go for it ??? as it says its an age defying products.